Hi everybody, my name's Mike and this is the Let's Speak Italian podcast. So you've listened to a few sample lessons, and hopefully you're learning how to speak Italian. Well with the first 100 lessons completed, I wanted to release the first few lessons for free as a little teaser so that you can see just how easy it is to learn to speak Italian. Now, by going to the website, you can buy the first 100 lessons for only $15.00. That includes 100 lessons, plus 20 review lessons as well, for a total of 120 lessons in all. That's 24 weeks of lessons, for only $15.00. It's over 13 hours of Italian lessons, for the price of what you might pay for one music CD. I've found that the key to learning to speak Italian is to learn a little bit every day, and to practice it with your friends. So get lessons 1-100, and listen to one lesson, every day for 24 weeks. By the end, you'll be amazed at how easy it was, and just how much you can learn by practicing a few minutes every day. 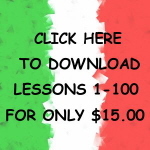 To download the first 100 lessons, just go to the web site at www.letsspeakitalian.net and click on the banner ad, or click on this link: Download Lessons 1-100. For only $15.00 you'll be speaking Italian before you know it. And here are some famous cities and their Italian and English pronunciations. BUY THE FIRST 100 LESSONS! The Pen Pal Program is for you to find new friends that you can practice Italian with. Have fun!! !